The Ariane 5 for Arianespace’s second flight of 2016 has completed its basic build-up, marking a key milestone as preparations advance for this early March mission from the Spaceport in French Guiana – which will carry the EUTELSAT 65 West A relay satellite. 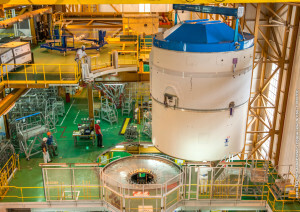 During activity this week inside the Spaceport’s Launcher Integration Building for Ariane 5, the “upper composite” – consisting of its cryogenic upper stage and equipment bay – was installed atop the workhorse vehicle’s already-assembled components: the core cryogenic stage and two solid propellant boosters. The Ariane 5 “upper composite” for Flight VA229 was hoisted in the Spaceport’s Launcher Integration Building, then positioned atop the vehicle’s core cryogenic stage for installation. 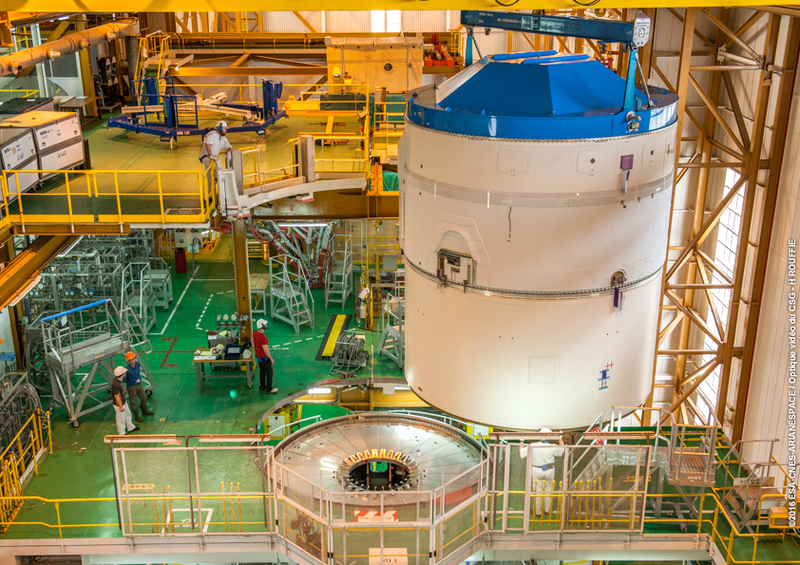 This process clears the way for additional integration and check-out, enabling Ariane 5’s subsequent rollout to the Final Assembly Building for installation of its single passenger. The upcoming mission with EUTELSAT 65 West A is designated Flight VA229 in Arianespace’s numbering system. It will be the 229th launch of an Ariane vehicle since the European launcher series entered operation in 1979, as well as the 85th flight of an Ariane 5 overall. Built by Space Systems Loral (SSL) for operator Eutelsat, EUTELSAT 65 West A will offer coverage for Latin America in C, Ku and Ka bands – providing video distribution and direct-to-home broadcasting, along with flexible high throughput for broadband access, from an orbital position of 65 deg. West. Arianespace’s started its 2016 launch activity earlier this week with Flight VA228 – an Ariane 5 mission performed on January 27 to orbit the Intelsat 29e relay satellite for Intelsat. Download the larger version of this story’s photo in the Gallery.